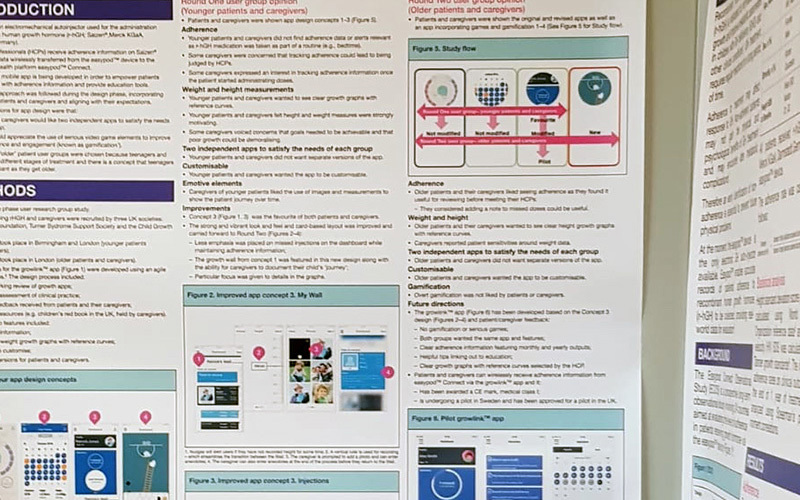 Frontend.com attended the ESPE 2018 — European Society for Paediatric Endocrinology conference in Athens along with our clients the Merck Group to present our research examining the attitudes of patients and their caregivers to using apps to track adherence and outcomes of growth hormone treatments. This research is important because – while much focus is reasonably given to understanding conditions and the development of new treatments – it is also essential to understand what patients need from their treatments and to find ways to get them to engage fully with those treatments. Our research focused on developing apps to work with connected auto-injectors for recombinant human growth hormone (r-hGH). Currently, the information from such auto-injectors is available to a patient’s Health Care Professionals (HCP) through an online eHealth portal. By developing an app that would also give this information to patients and caregivers our intention was to increase engagement with the treatment, leading to better adherence, and to greater feelings of control. Our research was based on a mix of in-depth interviews and focus groups. We researched several design elements and features, including separate apps for patients and caregivers, adherence data, the inclusion of gamification, the graphic design of user interfaces, the ability to track growth, and including certain types of information about the patient’s condition and treatment. Our research provided several interesting findings which we presented in Athens. These findings included the fact that overt gamification was a negative in this case, that providing reliable and detailed growth reference graphs was valuable, and that showing long-term adherence data was useful to patients and caregivers and could help empower them in their interactions with their HCPs. In general, while HCPs strive for monitoring, patients and caregivers would prefer clear, reference-based, motivating, and non-judgemental messages and information. Such an approach can help to engage patients and caregivers and help them to feel more in control of their treatment. Attending ESPE 18 in Athens was a great opportunity to engage with the latest research and thinking in the field of Paediatric Endocrinology. It is always fascinating to learn how treatments and research are developing at the frontiers of medical science.